This link apears to be dead, was this pulled? NVM ... i clicked a 2nd time and it opened fine .... browser woes! However, I did notice that this looks to be redhat tested only. Is there a Ubuntu version of this? Do we know if there is one in the works?In my company we are heavy docker users, but we use Ubuntu as the base, so it would be wonderful to try that. Is there an email address or somewhere where we can ask questions or create issue if we encounter some problems with DVP installation/configuration ? In my case it was because apps and management were separate in different VLANs which could not communicate with each other. The Volume plugin need to communicate with management to create storage volumes. 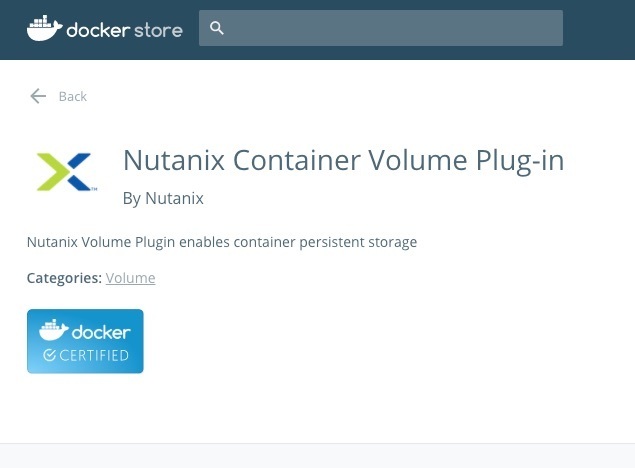 Nutanix seems to have improved the solution in last releases of AOS by separating cluster management and storage management, so the volume plugin may address storage management without having permissions on cluster management. I have not tested anymore because of lack of time but give us your feedback if you can test ! The plugin has been qualified on Centos 7, Rhel 7.3 and Ubuntu 16.04.2 and there are instructions on that Docker page that can help. With respect to the error you are getting might be best to give Nutanix support a call - that way you can securely transfer any logs, etc that might be need. For those just finding this thread We have implemented this in our corp services division and leverage it in conjunction with Docker + Nomad to provide a complete container solution that runs very well. Essentially we can declare the storage requirements in our nomad storage stanza, and the requested volume will be mounted if present, and created if missing. We then use the data protection feature to snapshot the data volumes so that we have a complete backup solution that works with containers. Pretty elegant all in all! We are receiving the same error message about /run/docker/plugins/.../nutanix.sock no such file or directory. The docker-volume-plugin:1.1.1 is in play. Using Docker 18.03.1-ce. The Nutanix Documentation and Knowledge Base are a mess with respect to Docker because they are obviously written at different points for different audiences, pre and post 'calm.io' acquisition and include no troubleshooting guidance at all. Even the practice labs associated with calm include no information on what to do if something goes wrong. Thanks @smoodo I will pass this along to the team and see if I can get you an answer. @aluciani Thank you for responding. We have one open #00338948. I am happy to contribute findings back to the community. The prospects of having this working are exciting. Happy to report that I made it beyond various obstacles and have some small discoveries that could improve the experience a bit. One of the unfortunate bits is that the docker volume plugin does not emit much in terms of errors that will let you know what precisely went wrong. What those instructions do not tell you is the following. Another stumbling block was accidentally typing the password wrong and in another iteration trying a Nutanix Volume Group name for the 'DEFAULT_CONTAINER' parameter, which should have been the Nutanix Storage Container name. In all cases of getting something wrong, the only error you will get is about the nutanix.sock file not being found. I have not found a way to change an already installed plugin's configuration. Doing a 'docker plugin rm nutanix' was sufficient and then I reran the docker plugin install line. A small detail on the plugin install line is the "--alias nutanix" part. That is from docker, and allows you to use the "--driver nutanix" versus the more verbose "--driver ntnx/nutanix_volume_plugin:1.1.1". These issues were hard to resolve because various sets of instructions left out details or the labs or tutorials assumed perfection. Another helpful tidbit came from a Nutanix Tech video locked within a series about improvements (so you have to wade through the whole series) where they explain that the docker volume plugin is essentially using the REST calls to orchestrate creating and destorying volumes used with Docker. Perhaps that should have been more obvious in hindsight, but knowing that told me how to think about what could go wrong with the plugin. (Password changes, port 443 problems, iscsi issues). The DATASERVICES_IP is an IP that is accessible in the IP Range of the Nutanix Cluster. Said in a fancier way 'in the same subnet'. There is nothing mysterious about it, but once you set it and start to configure things to expect it, you will have to own all of those configuration changes down the line. Password changes will probably not be elegant either, so a service account might be appropriate for production. My production use cases will be multi-docker-container clustered databases and clustered application specific repositories. We will likely try the orchestration on Kubernetes next, but first some experimentation with docker swarm and stacks. Thanks for the feedback @smoodo very detailed and I will share with the team. It's great to have you as a community member. Is this for AHV only? I would assume so but wanted to check. The plugin has been qualified on Centos 7, Rhel 7.3 and Ubuntu 16.04.2. It may work for older versions, but not every distro / version have been tested for this. Please use with caution. Best way would be to test it in a non-production VM and make sure that everything works, before installing this in your production Docker hosts / nodes.